LIVING A SIMPLY LUXURIOUS LIFE LOOKS LIKE? If so, take a moment to sit back and enjoy this video which offers a clear definition and a peek in Shannon Able’s own simply luxurious life. As you view, keep in mind that everyone’s curation will be uniquely their own, but the core concepts will be the same. 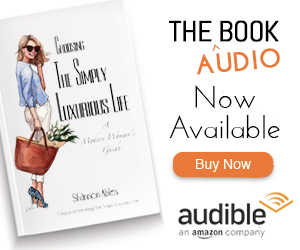 With step-by-step guidance, tips and inspiration, Choosing The Simply Luxurious Life: A Modern Woman’s Guide will help you turn your dream life into your real life – one that is full of true contentment and fulfillment.